Dear Readers, Good news! The Summer-Fall issue* is now available, and we’re excited to see it debut. We call this one The Social Media Issue. Yes, we’ve decided to devote an entire issue to exploring the ways and means of the poetic voice in the age of Click, Like, Share, and Tweet. Why The Social Media Issue? Poetry–especially lyric poetry–has historically drawn from all quarters to make feeling meaningful–imaginatively layered, memorably compressed. It is, in many ways, the original “social” media–the space where the inner life is turned outward, expressed and made public. Where are we now that our least whim and feeling can be instantly published, liked, monitored, and forgotten? We wanted to shed some light–however slant–on this, the inescapable algorithm of our time. Look for new poems by Dan Beachy-Quick, Bill Carty, Katharine Coles, Sharon Dolin, Bob Hicok, Rachel Kessler, Dorothea Lasky, Margaret Ross, Jason Whitmarsh, and many more. Anchoring the issue are essays by Zach Savich and Wendy Willis exploring the valences of poetry tracked and refracted through the instruments of social media and internet surveillance. You’ll also find visual art by the meticulous radiant Northwest artist Counsel Langley, marine photography by Adam Summers (whose “Hedgehog Skate” graces our cover), “photoems” by the always innovative Nance Van Winckel, and the amazing string and nail portraiture of Kumi Yamashita. In other words, more cutting edge poetry and art, a cut above the swarming age. 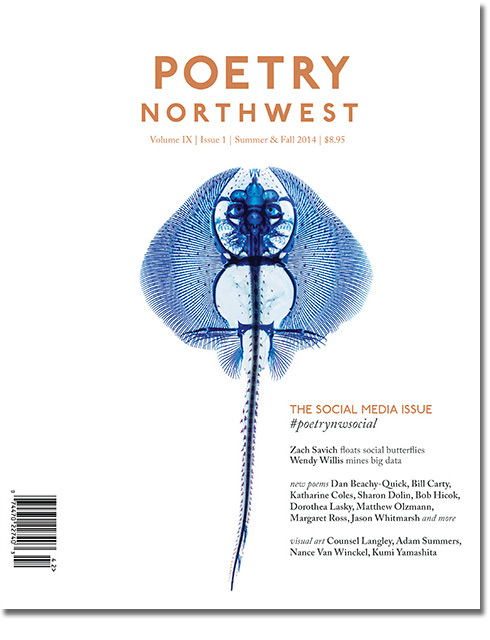 Subscribe now, or look for Poetry Northwest in independent bookstores nationwide. *Please note we’ve adjusted our production schedule to synchronize better with the academic calendar. We continue to publish two print issues per year, one in June (the Summer & Fall Issue) and one in December (the Winter & Spring Issue).